The Orchid Pond Fountains have exquisite outer jets that encircle a superior central jet. This perfect symmetry makes for a beautiful display on the waterfront! The Orchid Pond Fountains have exquisite outer jets that encircle a superior central jet. This perfect symmetry makes for a beautiful display on the waterfront! This Made in Canada floating pond fountains are sure to capture plenty of attention! All Orchid Pond fountains models are powered by a stainless steel; water cooled/ water lubricated submersible motor and stainless steel submersible pump. Heavy Duty float with a closed cell foam core. Includes plug and play 120 volt timer. Optional intake screen is available. Put the pump power cable through the center of the float. Connect heavy duty submersible power cable connector to pump connector. Uncoil the power cable back to the source. Lower the pump in to the float and rotate until it engages recessed pocket. No bolts necessary! Bring fountain to the desired location, tie the mooring ropes to the float and fasten ropes to shore posts or anchors. Alternatively cement block anchors can be used in bottom of pond. Connect timer to outdoor receptacle and plug fountain in to timer. You’re done. Time to enjoy the view! All Arbrux floating pond and lake fountains come with a 3 year warranty. 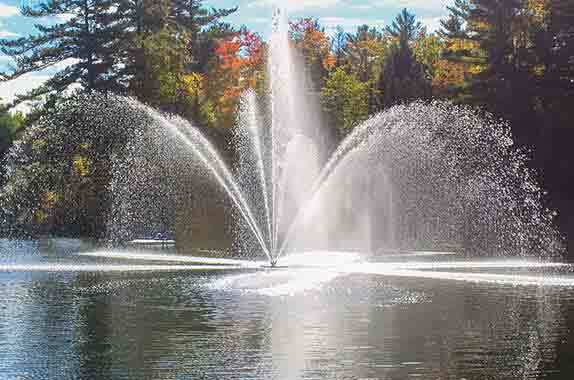 Each fountain is electrically safety tested and listed with ETL to CSA and UL standards.